Tag Archive | "atom x7"
Acer Predator 8 gaming tablet announced at Computex. Mobile gaming is coming to your hand. Acer have just announced the Acer Predator 8 tablet running on an Intel Atom X7. 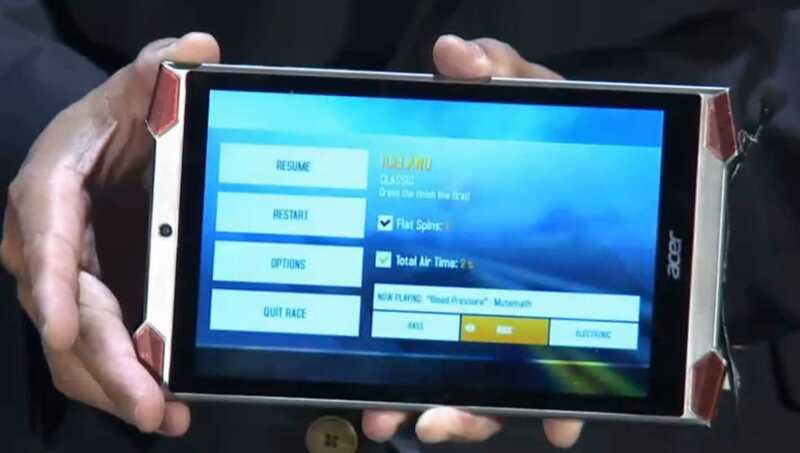 It’s a rugged 8-inch tablet with 4 speakers and running Android on an Intel Atom X7 platform. Intel X7 is the highest-performing Atom platform and has a much-improved graphics capability over the Baytrail-T platform and should work well for the most demanding app-store games on Android. A rugged, high-performance Android tablet has other uses too so let’s keep an eye on this one for ultra mobile computing uses. This is breaking news. We’re trying to get new information for you so check back here for more information as we find it. ASUS and Toshiba have a problem. They both launched 8.9-inch 1KG dockable tablets in Q1 2015 and before they got them to market the processing platform was upgraded and a shiny new product appeared. Microsoft’s Surface 3 runs on the brand new Atom X7 processor and clearly there’s going to be a run of new products leading up to Computex and ‘back-to-school’ period that will use X5 and X7 Atom. Why on earth would anybody want an ‘old’ Baytrail-T based tablet now? Microsoft’s Surface 3 runs on a new Atom X7 processor. Everyone that has reviewed the Surface 3 so far has been fairly confident that it can be a laptop replacement. Actually it can’t until you buy the keyboard for it but in terms of performance it’s not bad. The issue is that the previous generation Atom arent that much slower. If you look closely at the Lenovo Yoga Tablet 2 (Windows version) you’ll see a product that makes the Surface 3 look way overpriced. I’m using the Yoga Tablet 2 as the Surface 3 comparison for a number of reasons. It’s got a 1920×1200 10.1-inch (not 10.8-inch) IPS screen, a stand (continuously variable) and it weighs 629 grams which is just 7 grams more than the Surface 3. There’s 2 GB of RAM inside and a 1.3-1.8Ghz Baytrail-T processor. The battery is a huge 34 Wh which is 25% bigger than that in the Surface 3. Storage is small at 32GB (compared to 64Gb and much more usable space on the Surface 3.) The port choice is comparable although there’s only one micro-USB 2.0 port. It doesn’t have AC WiFi, it’s only a 32 bit version of Windows and there’s no digitizer layer. You can find all the information you need on the Microsoft Surface 3 here, and all the information you need on the Lenovo Yoga Tablet 2 here. In the USA there’s about $180 price difference. In Europe, where the Surface 3 is more expensive and the Yoga Tablet 2 is cheaper you’ll save yourself €250 and you’ll get the Bluetooth keyboard thrown in for the €349 total price saving around €380 over a base Surface 3 and keyboard. Half the price! I do agree that the Surface 3 is unique and that nothing directly compares to it but if you’re looking at the entry-level model of the Surface 3 and are not interested in the digitizer then the Yoga Tablet 2 is the better value product. I love the Yoga Tablet 2. The design is great, the screen pops and the keyboard is good (I had hands-on at MWC and CeBIT) and I like the battery hump because it’s a great way to hold the device. I’ve ordered it twice, and cancelled the order twice. I’m really close to buying one now just to compare in detail to the Surface 3 but you can see all the detail you need in this Notebookcheck review and I’m probably just looking for an excuse to buy it. 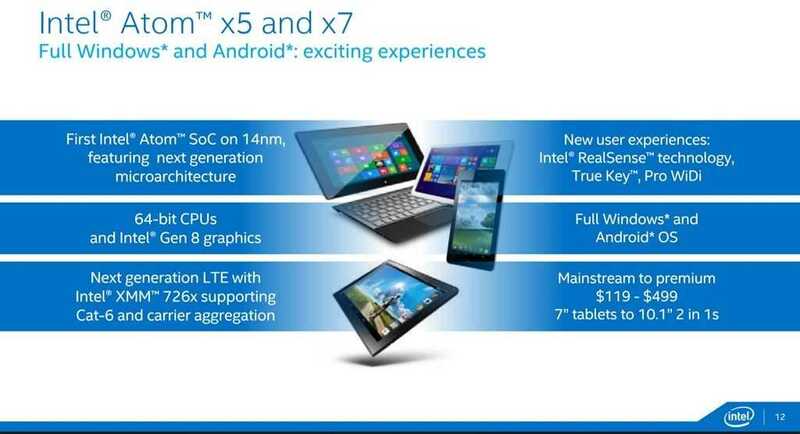 The other reason I won’t buy it now is because you’re going to see newer Atom X7 and X5-based tablets soon. While I don’t see much CPU and disk performance increases on a clock-for-clock basis we have to remember that the 14nm process used on the X5 and X7 frees up some Turbo Boost headroom. The Surface 3 can Turbo Boost to 2.4 Ghz meaning that Web activities are going to be noticeably quicker than on the classic 1.8 Ghz Atom Z3000-series. 4GB RAM is probably also worth waiting for…unless you need it now in which case there’s only one choice. The Surface 3 is unique when it comes to RAM and storage options and the excellent accessory range. Maybe we should stop comparing it to anything and just hope that it stimulates OEMs to launch a good range of competitors later this year. When I was reviewing the last generation Intel Atom-based low-cost laptops and tablets there was one question that I got more than anything. “Can it run Minecraft?” The same question now applies to the Surface 3. 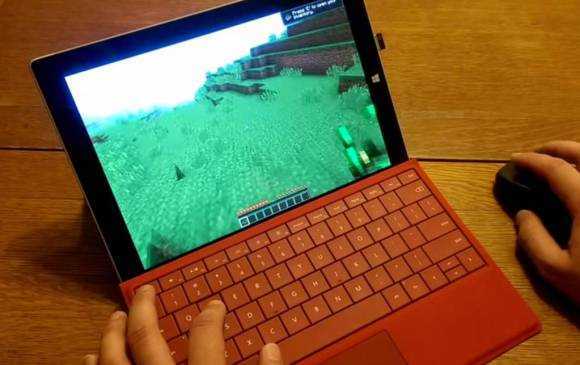 Can the Surface 3 run Minecraft? The Surface 3 is never going to be the ultimate gaming machine but with this video I can see potential for some low-end desktop gaming and of course, great support for all the Windows Store games and that’s really going to help convince the target audience. Surface 3 with Atom X7 is just $499 and ultra-mobile. Bill Gates must be so happy today. The Microsoft Surface 3 has just launched with an Intel Atom X7 quad-core at $499 and with it, the TabletPC has reached a new landmark. The Surface 3 takes the design of the successful Surface Pro 3 and squeezes it down into a 10.8 screen form factor and a 622 gram weight. 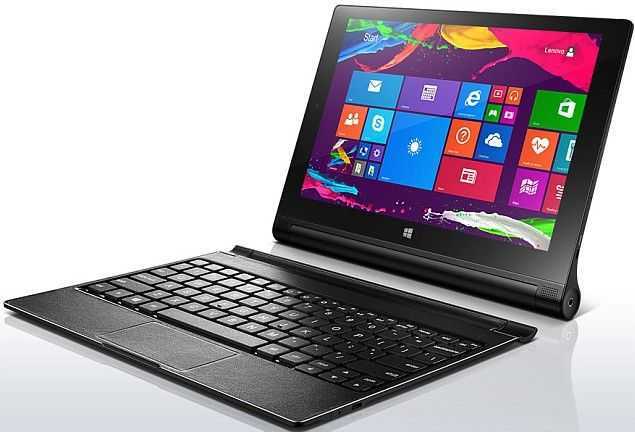 This fanless Windows 8.1 (with free Windows 10 upgrade) tablet PC is also offering to do-it-all with the optional backlit Type Cover keyboard. I think you’ll see a bunch of cheaper options during 2015 but, like the Surface Pro 3, the Surface 3 is going to be an item that has quality on its side. An LTE option is available ($100 more) and you can pick up 4GB and 128GB storage options too. There’s also a USB 3.0 connector and USB 2.0 (micro for charging and data) so you’ve got mobile power and connectivity options too. There’s no USB-C port. The storage will be eMMC based (Atom X7 doesn’t support SATA) so you won’t get the fast speeds of the SSD on the Surface Pro 3. It’s going to be fast enough for daily consumption use, but you never know the limits until you run the tests. The other missing data-point is the Surface 3 battery size in Wh. ’10 hours’ video playback isn’t really much to go on but I’ll guess at 35Wh and 7 hrs browsing at this stage given what I know about the platform and its predecessor. 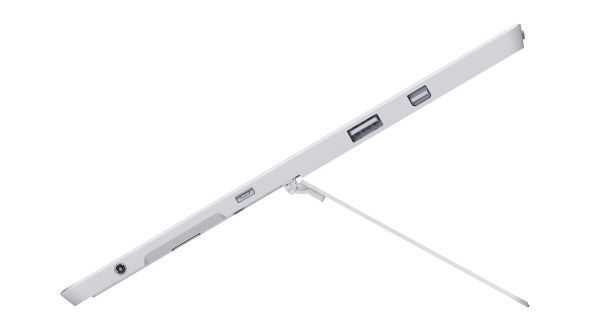 The stand has three positions (not like the Surface Pro 3) and the screen resolution is 1920 x 1280 (3:2 ratio) which should help it in the hands. The Surface 3 is just 8.2 mm thick. Microsoft Surface 3 comes with one year of Office 365 and 1TB of OneDrive storage. More specifications, notes, videos and images here in our database. 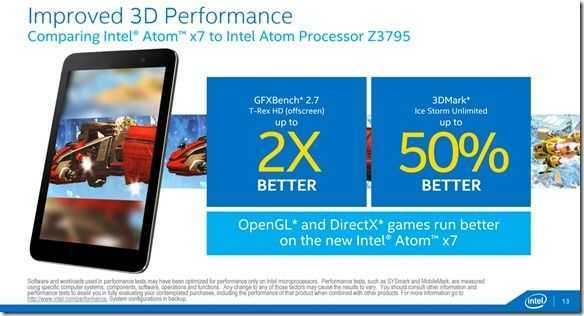 CPU type: Intel Atom x7-Z8700 quad-core 1.6 – 2.4 Ghz with Gen 8 graphics. Screen Type: LED-Backlit LCD, wide viewing angle. Touch with digitizer support. Wireless Interfaces: 802.11ac, Bluetooth 4.0. LTE option. Optional: Backlit Keyboard, Surface Pen. One has to assume that Microsoft are going to offer bundles with the dedicated Type Cover keyboard and Surface Pen in the future but for now you’re looking at a minimum of around $650 for that set-up and that means it’s not really a cheap option, especially if you think you might need (you probably will) 4GB of RAM. That option adds another $100 to the price. There’s also the question of Cherry Trail performance. Microsoft have chosen a high-end version of the X7 and with the right eMMC storage it shouldn’t be slow to respond but you won’t be running desktop games on this and video editing/rendering is not exactly going to be barrier-free. If you want LTE you’ll need to budget for that ($699 with 4 GB RAM and 128 GB storage.) and you’ll have to wait until mid June in the USA. That’s 2.5 months away and a lot can happen in that time. Adding the pen and keyboard will take you up to over $850. A list of 10-inch tablet PCs from our database. The Surface Pro 3 has proven to be an incredibly versatile device and the ingredients seem to be there for the Surface 3 to be even better in the mobility department but at 10.8-inches the Surface 3 is a tablet-first device and won’t be as productive as the Surface Pro 3 with the keyboard. We all know the compromises that come with a 10-inch screen / keyboard. 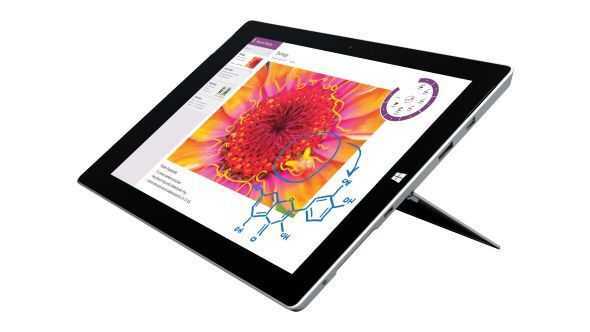 If you add in a bit of discounting and look at the Surface 3 as a mobile tabletPC then it makes more sense. The weight is right, the battery life could be right and there’s bound to be a good community that builds around it. Let us know your thoughts below. Were you hoping for an even smaller Surface? Waiting for a Surface Pro 3-M (with Core M) or are you waiting for a Surface Pro 4 with Broadwell-U? 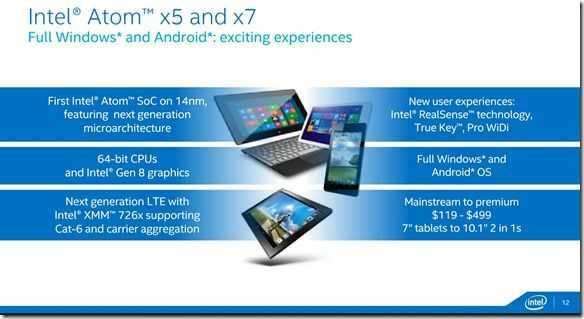 Pay attention mobile computing fan, because the Intel Atom X3, X5 and x7 are looking good! 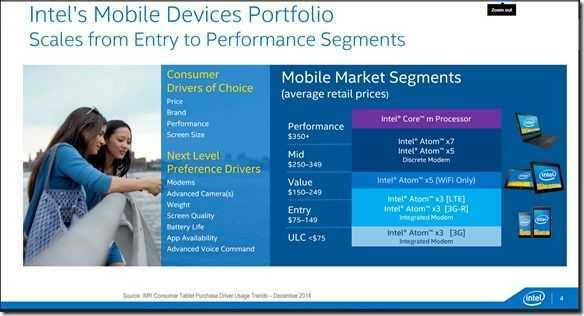 Intel have just released more details at MWC. 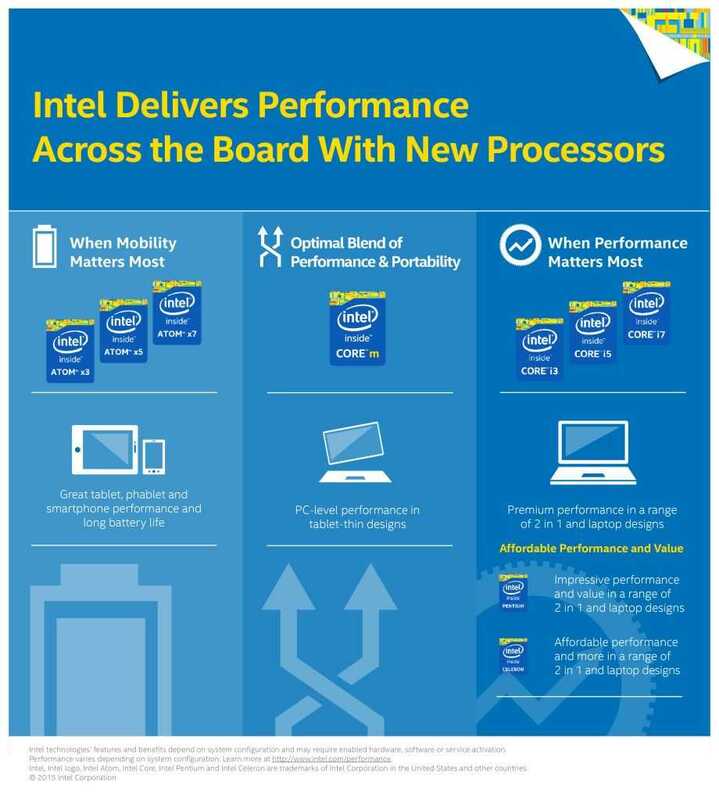 We heard about the new Intel Atom naming scheme last week and it was fairly clear that Intel would be using the new designations on the 14nm Cherry Trail range of processors. Those processors (Z8000-series) are actually going to slot into the x5 and x7 ranges with Sofia (C3000-series with integrated 3G and/or LTE) sitting in the Intel Atom x3 slot. 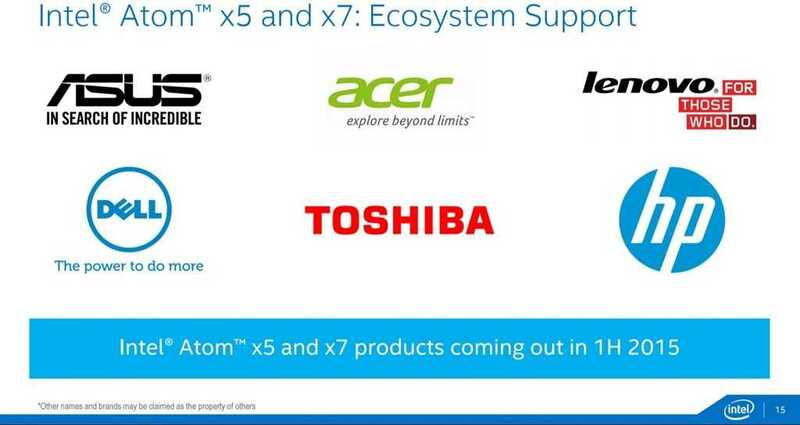 While all ‘x’ ranges could include Windows products it’s the x5 and x7 that will interest us more as the Cherry Trail architecture leans towards more productive, feature-full tablets and 2-in-1s. Intel have announced that 6 partners have products coming in the first half of 2015. 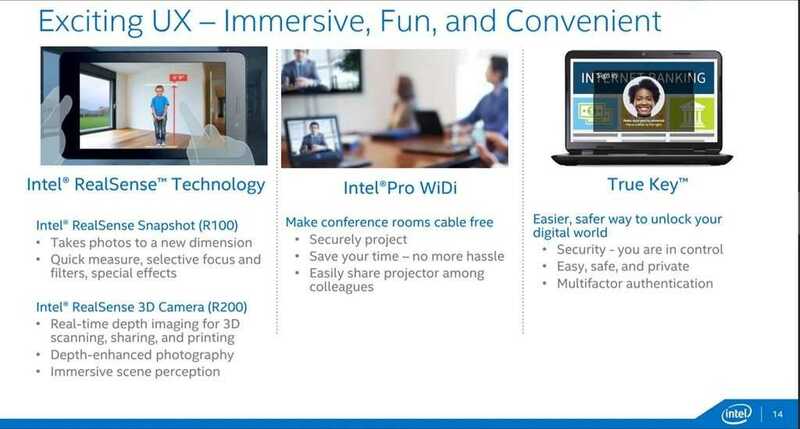 Here’s a round-up of the product types that Intel are aiming at. Intel has revealed today that Cherry Trail comes in three variants. The Z8700 series will fit into the x7 range as the performance option with Z8500 and Z8300 dropping into the middle-range. 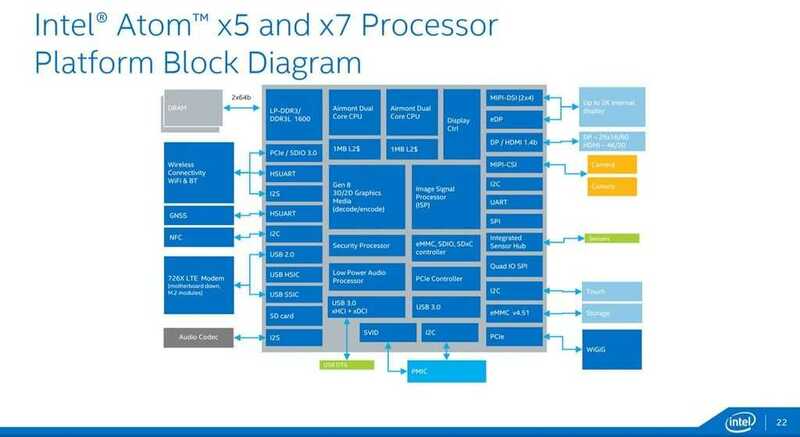 It’s not clear if x7 will also include more features than x5 but if you look at the key features that Intel are highlighting on Cherry Trail it would make sense if x7 were to host them. RealSense is going to appear in both R100 form (post-processed selective focus, special effects as seen in the Dell Venue 8 7000) and R200 with real-time depth imaging. Intel Pro WiDi is highlighted too which means business-class WiDi (with more security features) comes into the Atom range. True Key is a facial recognition security feature that we suspect is only enabled by RealSense. We’ll check that for you over the coming hours and days. 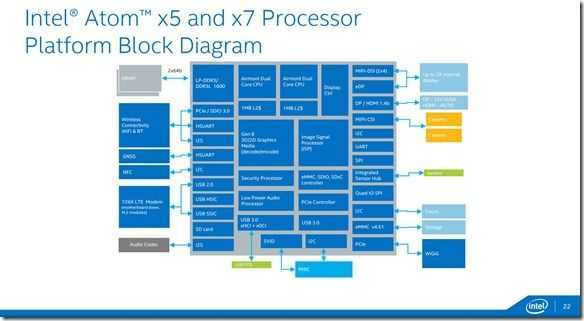 The x5/x7 block diagram shows us that we’re still going to be stuck with eMMC as the storage interface but there’s a new audio processor which should improve battery life on video playback as it does on Core M products. HDMI 1.4b (4K/30 fps) is supported as are internal displays of up to 2K resolution. 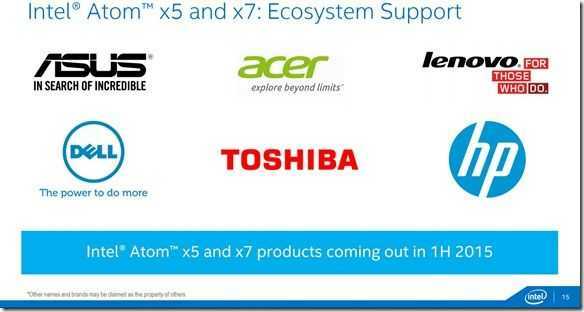 Atom x3, x5, x7 branding for next-gen Intel mobile processors. 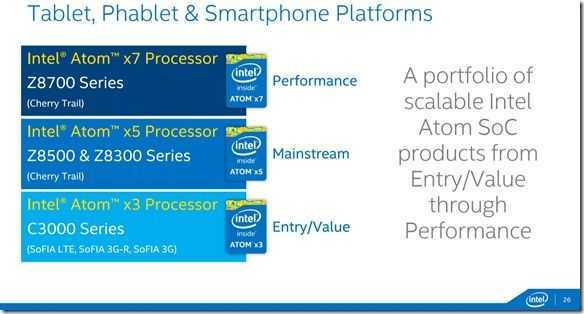 Intel are going to introduce the next generation of mobile processors under new Atom branding. Atom x3, x5 and x7 will be used to differentiate features bringing it in line with the way that Core processors are branded with i3, i5 and i7. An infographic just released by Intel gives us an overview of the target markets for Atom and Core brands after the new products are introduced. Unfortunately there isn’t much detail available but we’ve uncovered a couple of snippets for you below.